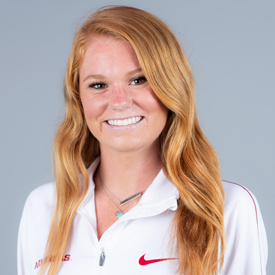 Began her sophomore year at the Cowboy Preview (Sept. 1) finishing with the eighth-best time for Arkansas and 23rd overall at 11:24.60 … In her last meet of the season, Jeacock finished with the fifth-best time for the Razorbacks at 18:47.87, finishing 68th overall at the Missouri Southern Stampede (Sept. 16). Opened her first competition season, placing 35th at the Cowboy Duals (9/1) … Finished second for Arkansas and third overall in the Missouri Southern Stampede 5K (9/17) with a time of 18:13.07 … Placed 66th overall at the Chile Pepper festival (10/15). Utilized a redshirt during her first year on campus. Captain of the cross country team … member of student council … active volunteer for various programs/events. Born on April 30, 1997 … Daughter of Simon and Jennie Jeacock … Has two sisters, Charlotte and Amy … Majoring in public health and distribution.